As if being married to him wasn't hard enough! Nodaway Falls turns out to be a town with more than a little magic in the air. Eliot swore off using her own powers sixteen years ago, thanks to one catastrophic day when she lost the only people who ever mattered to her, and ran away from her spellbinding father and his reckless enchantments. Now, when a chance encounter with quiet, handsome Desmond Lamb results in a magical explosion that rocks Eliot to the core, she can't help but wonder: Has her heart fallen under some sort of spell? Or is this what true love really feels like? The real question, of course, is whether her husband will stop haunting her . . . and let Desmond give her a chance at happily ever after? 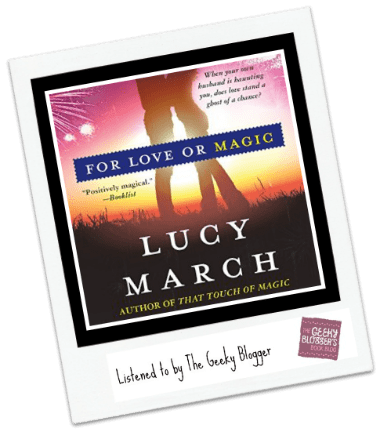 First Thought when Finished: For Love or Magic is possibly my favorite in the series! Quick Thoughts: I have really enjoyed my time in Nodaway Falls (I am not sure it is the end but this read a bit like it is). This series is a great mix of mystery and romance! I was so happy with how everyone from the previous books were parts of the story. Specifically Stacy with whom I adored because she was so imperfect. I felt there was some unresolved things from her story so I was giddy when she was on the page. I have to say after Stacy/Leo’s book, I was really looking forward to Desmond’s story. I had a point where I got truly frustrated with him but in the end he pulled it out. Eliot, however, was amazing. I totally adored her. She was such a level-headed, smart, and full of gumption leading lady. Their final moment in the book was so “them” that I listened to it twice. I couldn’t have picked a better place for Desmond to be than with Eliot. I was left with smiles and giggles! I recommend this series if you like quirky, strong, bull-headed women who get thrown into things over their head. I love that Lucy writes them real and a bit reckless. Overall just a downright fun read. It is no secret that I am a HUGE fan of Amanda Ronconi and she delivered again. She is just sassy and perfect for characters that exude that. She brings out the humor and always makes listening fun. The 2nd book had weird pacing and the romance was a little flat. Plus honestly I was more invest in Desmond during book 2 which also distracted from Stacy/Leo. So as you can see–book 2 wasn’t my favorite either. So you were spot on. This one though wrapped everything up and everyone was there! Hmm I think I have to take a trip to Nodoway Falls, Felicia, because it sounds like a great series, and if the narration is excellent that’s a good point as well. I hadn’t heard of this author or series before. I’ll have to check it out. I love strong women too! It’s so endearing when they soften up for the right guy. The tension and push and pull, when done well, ican make any reader swoon. I listened to the first book in this series a while back. Jennifer recommended it to me. I enjoyed it. I never did finish the series. I really should look into getting the rest of them. *eyebrows lift* Hm… I do think I need this series in my life. Sounds like fun and I do like that narrator. It was fun 🙂 A little quirky and different! oh this sounds great!! I have heard so many great things about this narrator, so I am very intrigued by this one. Ahh… this sounds sweet and fun. I will have to try this series. I’ve heard lots of good things about this narrator though I’m not familiar with the author. I’ll check out my library to see if they carry the series. This does sound like a really fun series. I love strong leading ladies and I bet Amanda Ronconi just rocked it. She freaking nailed it 🙂 🙂 It was fun and quirky!